This project began when I discovered all of the beautiful and colorful cookies that could be made at home simply with royal icing. I was planning on starting with a simple project like snowmen for the holidays. However, I discovered the store New York Cake, where you can purchase just about anything for baking projects (including royal icing, an array of professional food colorings, hundreds of cookie cutters, fondant and gold powder to name a few), all at extremely reasonable prices. 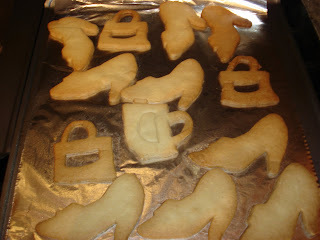 When exploring the website, I noticed that they sold cookie cutters in the shapes of purses and shoes, and thus an idea was born. I just realized that they also sell purse shaped cake pans for making purse cakes with fondant, which I plan on doing in a future project. For this project I purchased the following: a couple of one pound bags of royal icing mix (basically confectioners sugar and meringue powder), the cookie cutters mentioned above, and a set of 12 professional food colorings. This makes a perfect group project, and we were joined by one of my good friends from college, Dave and his fiance Marielle, who were visiting from Boston over the holidays. Using your mixer, beat the butter and the sugar well for a couple of minutes at medium speed. Lower the speed and beat in the eggs and vanilla extract. Then slowly add the dry ingredients and mix fully until it forms a cookie dough. Roll out the dough on a large area using a rolling pin (you can use a bit of flour if the dough is too sticky) until it is about 1/4 inch thick. Note: I am not so great at this step, but someone who has a little more upper-body muscle can surely help out here. Then, cut with the cookie cutters and bake the shapes at 350 F for about 15 minutes. To make the Royal icing, I suggest purchasing and using a small bag from NY Cake (see links above). We followed the instructions on the bag but added an extra tablespoon of water to make the icing a little easier to use. 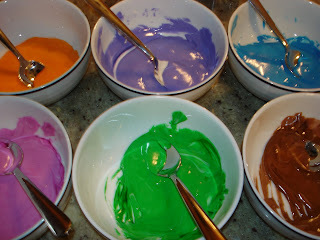 Then we divided the icing into seven bowls and mixed with a drop or two (use very sparingly as the coloring is very strong) of the high-grade food colorings. This turned out to be plenty of icing to color all the cookies. 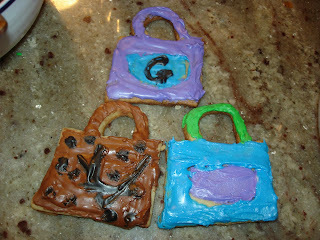 Then for the fun part - Brad, Dave, Marielle and I "painted" the cookies to make them look like purses and shoes. I would suggest using a set of inexpensive watercolor brushes (ones that are unused). I had an inexpensive set of brushes that I intended to use for this project, but somehow had misplaced all but one or two of the brushes, so we used a combination of the brushes we had, and some spoons and other utensils. This worked out just fine, actually, but NY Cake also sells fine tip plastic bottles for applying Royal icing, which I plan on investing in for my next Royal icing project. The food colorings were fantastic, as the colors were vibrant and beautiful. Such colorings can also be used when working with marzipan and fondant. If the icing starts to harden in the bowls (because you and you friends don't decorate the cookies fast enough) you can add a teaspoon of water. 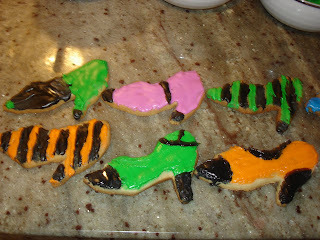 Some of the cookies looked better artistically than others. We did attempt to make a few "designer" purses, using as models a few dog-designer purses in my pug's toy collection (she has a few classics - Chewy Vuitton, Muttsoni, plus a Dolce & Grrrrbana Shoe). This was a fun New Years Day project to do with out out of town friends and thus, I highly recommend such cookie parties as a great way to spend time with friends. Future projects to look for in the New Year from my kitchen: homemade limoncello, new salad recipes, homemade hard cheeses, tiramisu triffles, chicken marsala and glow-in-the-dark jello.